You are now in the “new hire” section of USC’s Employee Gateway, our “one-stop site” for all employment-related information for faculty and staff. Check out our Quick guide to the USC Employee Gateway to get an idea of all the resources available to you here, including comprehensive benefits information. The university has likely already assigned you a 10-digit USC ID, which should be emailed to you before your first day, along with a link to allow you to activate your USC NetID. This is a combination username/password that you will use for numerous log-in systems throughout the university, including Workday, which is the university’s comprehensive employee self-serve system that tracks payroll, benefits, time off, performance management, and more. Your USC NetID is sometimes referred to as the “shibboleth” password. If you have your 10-digit USC ID, activate your USC NetID at our IT website. Questions? Contact the HR Service Center. The Duo system provides additional security for your personal information in Workday and other USC systems. After you enter your USC NetID, Duo sends a notification to your cell phone requesting you confirm the log-in. It’s simple to install and use! If you don’t have a cell phone, you can set Duo up to ring a landline phone for confirmation. You also activate Duo at our IT website. Workday is completely in the “cloud” so you can sign in from anywhere that has an internet connection, using your USC NetID. To log in, just look for the Workday icon in the popular links on the Employee Gateway’s front page (you’re on the Gateway now!). Here’s a helpful guide – Getting started with Workday – to help you begin. Workday maintains personal information relative to your employment, and USC relies on you to ensure your information is correct and that you’ve provided all information required to meet our payroll and regulatory requirements. Follow these steps in our personal information guide to complete your review. All employees are required to adhere to all university policy. Visit the policy website. Shortly after you begin your new job, you’ll need to enroll in benefits. Carefully studying your options now (see the benefits section of this site) will make that process run smoothly. Or you can attend a benefits orientation for some in-person guidance. Before you arrive, we recommend that you familiarize yourself with parking here at USC. 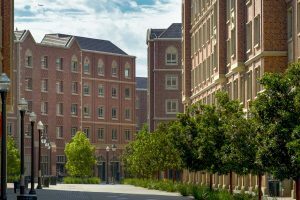 The USC Transportation website includes information on parking, permits, and much more. More comprehensive commuter information is available here on the Employee Gateway commuting & parking page. Although it’s important to familiarize yourself with the university at large, you’ll want to learn more about the department where you’ll be working, too. Visit the USC home page and locate your department’s website through the search box in the top right corner of the page. There are plenty of choices for lunch (and breakfast and dinner, for that matter), both on and around our campuses. To start, explore the USC Hospitality site for a full listing of USC restaurant locations. Learn why being in the Trojan Family is special!